Although I am not the Cubmaster anymore, I wanted to share this project. In the past, the Raingutter Regatta was a troublesome event. The kids enjoyed it well enough, but for raingutters, all we had were vinyl gutters. It was always a trick to get them elevated, so that the kids could stand and walk beside them, but keep them supported enough so they wouldn't collapse when filled with water. Also, the end caps just snapped onto the gutters, and they never formed a perfect seal; so someone had to be volunteered to keep a bucket filled so the gutters could be refilled as needed. While the kids deal with it well enough, you definitely notice a drop in enthusiasm when they have to wait for the adults to figure out how to shore up a gutter and refill it with water every couple races. Last summer, I was the Cubmaster, and I got to the church early to start setting up the gutters. I thought I had a bit of an advantage over years past in that we had a new building that had a pavilion with picnic tables. The tables, I figured, would support the length of the gutters and keep them from folding. All I needed to do was support the sides. As I was filling the gutters with water and trying to figure things out, however, I was blindsided by nothing short of a miracle. 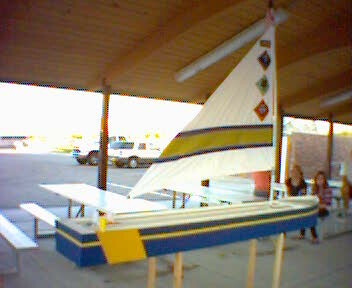 Our newly-called Webelos den leader had taken it upon himself to build the project you see in the picture above. (Click the picture to see a couple more images — unfortunately taken from my outdated cell phone.) He pulled up in his truck and asked me to help him unload this large boat from the back. He said he didn't want to say anything before, because he wasn't sure he could finish it in time. Indeed, he had just put some of the finishing touches on it that afternoon. It was, to say the least, amazing. A length of PVC pipe, cut in half, formed the tracks, which were wide enough to accommodate the hulls of the boat kits we were using (which were simple styrofoam blocks — much lower tech than the Pinewood Derby cars, but much easier for the boys to cut and form on their own). The half-pipes were laid in the top of the wooden form of a large boat. (Last year, the boat did not have the sail; that was something he added for this year.) A drain hole was drilled in the bottom of one end of each track, with a standard rubber drain stopper plugging it up, so the tracks could be easily drained at the end of the night. We had some minor problems with leaks — because he caulked it earlier that day, it didn't have time to completely dry and seal — but it wasn't anything we weren't used to. There was no worrying about gutters buckling or collapsing, and the legs were sturdy enough to keep it from going anywhere when it got bumped. It certainly made my day. And the boys', too. That event was easily one of the most successful we had all year. Following up to this post, where I ponder what happened to a certain Microsoft software product that seemed way ahead of its time hit the market and disappeared with almost no fanfare. At my new job, I just got my phone configured. It's an IP phone that plugs into an ethernet jack (and apparently draws power from that jack as well, as there is no other power cord), and once it connected and downloaded all its necessary updates, the IT guy walked me through some of the features. He directed me to set up my voicemail account. He pressed the voicemail button, and a friendly-sounding, female, synthesized voice announced, "Welcome to Microsoft Exchange." He then gave me a quick overview of the features available, which included the ability to access my email from my phone. It would appear that Microsoft Phone grew up, moved out of the house, and got a job in the corporate world. It certainly has come a long way. One of the "cool" features he demonstrated was the voice-activated directory. He pushed "Directory", and the voice prompt asked for the name of the person to call. In his moderate southeast Asian accent, and in a relatively soft voice, he spoke the name of the coworker in a neighboring cubicle. Within a second, the computer repeated the name (which it got exactly right on the first try), asked for confirmation, and then proceeded to dial. Later, when I set up my voicemail account (setting my own PIN, greeting message, etc. ), I experimented a bit. One of the options presented to me was "Calendar". I chose that option, specified "Today" (at which point the computer told me I could just say "Calendar for today" at the main menu to get straight to this point), and the computer proceeded to read to me my appointments for the day. The voice synthesis was very clear. While it could never compare to seeing the information on the screen where you could glance at any piece of information at will instead of waiting for it to be read to you, it was no different than, say, the difference between reading a book and listening to an audiobook version of the same. All of the commands were done by voice. At no time did I have to repeat a command that the computer didn't hear, nor did it misinterpret any command I gave it; and I didn't speak any louder or exaggerate my pronounciation when I gave my commands. Although, the whole interchange was a little slow, considering I had to wait at the end of each operation for the computer to give me a list of all the things I was "allowed" to say. (I would imagine that accuracy goes way up when the number of possible inputs is constrained.) It was still far easier than the laughable experience I had trying to use voice controls in Windows Vista. I am a little disappointed that this product does not appear to be available for the home anymore. More than once, I've been away from home and wished I could have easy access to an email when all I had was my phone. However, I think they're probaby dead on in their target market. It seems like people are using their cell phones more than their home computers as their address books and calendars, so the need to "phone home" just isn't there. Those who do access email on the road tend to pay for a data plan for their cell phones, so they can scan through email visually instead of having it read to them linearly — a huge advantage on a home email account that may get email from hundreds of sources, most of it spam that gets through filters. On the flip side, business email accounts tend to be more business-focused (in my experience; YMMV), so hearing unread email can be less of an exercise in "sifting through junk". Also, providing a phone access path to check information means that all employees can access their personal accounts without providing or provisioning VPN accounts, company cell phones, data plans, etc. When I was "downsized", I got some severance pay in addition to my unused vacation time. Because of this, my unemployment benefits were due to not start until a few weeks after my actual termination date. Today, I started my new job. I had a few interviews that came down to a couple solid possibilities. Both were very good jobs, and I thought it would come down to a choice between them. While I was waiting to hear a final decision, I spent some time in prayer that I would be guided to the right job. Sure enough, I only got an offer from one company; the other told me my qualifications were perfect, but they decided to go with another candidate who they just "felt was a better fit". I supposed I should be used to this by now, but I'm still impressed, and thankful, with how Heavenly Father provides a very clear path to what He has provided for me. The path may not always be the smoothest or the shortest, but it's always gotten me where I've needed to be. I got a notice in the mail a while back about a recall Toyota is doing on vehicles, including my Prius, for a possibility of floor mats jamming accelerator pedals. Now, I'm more inclined to believe this is more media hype than any actual problem, but as long as it's free, I have free time, and especially since they were promising a free floor vacuuming with the service, I might as well take the car in. So I made an appointment. I left for the dealer this morning, and my wife promised to leave shortly thereafter in the minivan to pick me up. On my way in, though, I got a call from an upset wife. The van wouldn't start. The battery didn't have enough of a charge to turn it over. This was a new battery, one we bought earlier this year. It should not be dead. Unfortunately, it didn't agree. Now, fortunately, we have a plug-in battery charger that we got many years ago, so she began charging it while I dropped off my car. Since she was going to be leaving a lot later, I walked over to our next stop, the FedEx center, to pick up a package from my former employer that had apparently already forgotten my correct address. A healthy dose of exercise and still a ten minute wait, and my wife drove by to pick me up. We were going to get family pictures today, so we went to the shopping center. My wife wanted to stop by the shoe store to get new shoes for a couple of the kids first, so we pulled up there. The baby was still asleep, so I was going to wait in the van. She rolled down the windows and shut off the minivan. While we were unloading, though, the baby woke up. I went to start the car to roll the windows up, but all I got in response was "click click click click click". Despite the 40-minute round trip to pick me up from FedEx and come back to the shopping center, the battery had no charge. And now, we were stranded on the wrong side of the shopping center. We hiked across the shopping center to get to our picture appointment. Fortunately, it was still morning, so it was not too warm yet; but it was still a decent hike with four kids, slightly uphill, passing a distance that included a full-size Wal-Mart and a Sam's Club (these are not small stores). Once we got to our picture appointment (on time, even), we started trying to call the phone numbers of anyone we had in our cell phones to see who might be home and who might be able to shuttle one of us home to get jumper cables and to my mother's to pick up her truck. Fortunately, she was willing to let us try jump-starting off of her truck. We just had to go back to my house to pick up the jumper cables I forgot to grab. (I was going to pick them up after I got my mother's truck.) And, fortunately more, we weren't inconveniencing her much; through all the driving around, her daughters in the car were lulled into a nap they don't usually get, so she was getting a nice bonus. Jump-starting the minivan was fairly uneventful, except for the usual problems of trying to get the clamps secured on the terminals and finding a good ground. Rant time: Why don't they make battery terminals longer, so that jumper cables aren't constantly in danger of slipping off the things? And, why don't they make an obvious grounding post for clamping the negative cable? The first place I clamped it was secure, but obviously not a decent ground, as it completely failed to start the car; as soon as I clamped it to a less secure but more obviously metal bolt, the minivan started right up on the first try. Rant over. We thanked our friend profusely for the ride and vowed not to turn off the minivan for as long as we could. My wife followed me to my mother's, so we could grab her truck. (If we needed to leave the minivan behind while it got its battery replaced, we would need the extra vehicle to get home.) With the garage door opener in the minivan, this was a much easier trip. We made a long drive to Sears, where we bought the battery, so they could check it out and replace it. Long story short, they were able to replace it while we wandered the store, so we were able to take the minivan home. They said it was in fact a bad battery, and everything else checked out ok. Unfortunately, this not only made the truck unnecessary, having the extra vehicle meant we were unable to simply stop by and pick up my car, which was already done and will now require another extra trip out to go get. I'm not usually one to consider the 13th of a month falling on a Friday as being anything but a statistical curiosity, but it certainly seemed unlucky today. Still, it all worked out in the end, and the worst of it was just inconvenience. Annoying, exhausting inconvenience, but just inconvenience. Cell phone "elitists" bug me. These are the people who insist that land lines or home phones are relics of a bygone era, and anyone who has a home phone are either simply wasting their money, or refusing to change with the times, or are somehow mentally deficient for not ridding themselves of a land line and going exclusively with cellular phones. We know a handful of families that have ditched the land line and gone entirely with cell phones. (To their credit, they have been far from "elitist" about it.) Unfortunately, we have encountered some common problems trying to call our cellphone-only friends. These are based on actual, real-life experiences. You have to double (or more) the number of phone numbers you have to know to call the family. You can't just call one number for the family, you have to know the number for the husband, and the one for the wife, and possibly the numbers for any children. You don't know if they are home when you call, and you will end up reaching them at an otherwise inconvenient time (i.e., when they are out shopping, at work, running some other errand, away on vacation). If you don't care whom you contact (i.e., you want to call the family to set up a visit, invite them to dinner, pass them some information about a community event, etc. ), you end up having to decide whom you're going to contact. The person you decide to contact will end up being the least convenient person, as they will end up being the one who is out of the house (as above), greatly raising the chance any information you wanted to convey to the family will be long forgotten by the time said person returns home. The cell coverage in the neighborhood isn't great, and the call will end up sounding like tin cans and string (when it's not dropped). This seems to be especially true in our "outer suburbian" neighborhoods, and even more so near certain schools. Even when the desired person is at home, and assuming their phone is getting enough reception, it is not uncommon for someone to misplace their pocket-sized device, or not hear the single ringing phone from elsewhere in the house; and they can easily miss the call for being unable to hear or find their phone in time. While I could possibly see this working more for singles or couples, it just doesn't make sense to me for families. In order to allow your children to make or receive phone calls at all, you either have to yield "your" cell phone, or shell out the money for their own. I understand why some people do it. The families we know that have gone to cell phones have done so to save money, and to get away from endless telemarketing calls. Those are certainly appealing reasons — we easily get three times as many unwanted calls on our land line as calls we actually want to take. But in practice, it just makes calling a family unnecessarily complicated, and they are just problems we'd rather avoid. It's not a waste of money, and we're not stupid or living in the past.